17 year old Monasterevin girl Doireann Fahey was thrilled after picking up her first Champions League win for Wexford Youths last week. Playing in Belfast, Wexford led 2-1 when Fahey was introduced as an 87th minute substitute but disaster struck when Linfield equalised in the first minute of injury time. However, there was more drama to come as Kyle Murphy found the back of the net in the 95th minute to clinch a 3-2 win. The game was Wexford’s last game in the group having lost to Ajax and Thor in their first two games. “It was a great feeling,” said Fahey when speaking the day after the game. “The first two games were tough, we knew what we were coming up against, we tired our hardest in those games so it was nice for that work to pay off in the third game against Linfield. Linfield were a strong team too and they definitely proved that to us so that made it feel better when the work paid off. “When the equaliser went in, we knew that we had only one last chance to get our win. We weren’t going to leave that behind and it was really important for us to get that win because we wanted to have our chins up going back into the league. To get that goal was a great feeling and it genuinely meant a lot. It wasn’t just for our pride in the Champions League, we wanted to be strong and positive going back into the league,” said Fahey. Fahey had started the earlier group games against Dutch champions Ajax and the Icelandic side Thor and said it was a great experience to play against players of such a high calibre. “It was amazing. When that chance comes along you really want to take it, you know yourself that you won’t get many chances like this. To play a team like that, it was genuinely one of the hardest games I’ve played in. Ajax and Thor are professional and semi-professional teams and that really shows on the pitch. They are super composed on the ball and their fitness is amazing. It was tough but at the same time, it was great to learn from. Because I’m so young, going into an environment like that was nerve racking but it was I definitely did learn a lot from it and coming out of it, it was very motivational for me to push on and try to make it to that level,” said Fahey. The youngster, who has previously played GAA for Ballykelly, has made huge strides in a short space of time playing for Ireland’s best team. Fahey joined from Peamount and marked her debut in July with a goal against Kilkenny Utd and Wexford are currently unbeaten in the league and six points clear of nearest rivals Shelbourne. “I just came out of a rough patch, I was trying to get my time on the pitch and things weren’t really going well. When I went out on the pitch for the first time in a Wexford jersey I just really wanted to make a statement and show everyone that I am capable and maybe deserved a bit better. It was something that I wanted to prove and to get that goal I was delighted. I just hope that showed that I am able in the league and that I want to progress,” she said. The Under 19 international has enjoyed the step up to play with Wexford. “You do learn a lot. The players you are with, you want to do what they are doing so that you can progress to where they are now. You kind of copy little things that they do and see things that you can bring into your own game. When you are around those kind of players you are just constantly learning, they lead by example 100%. Kylie on our team is a super captain and I’ve learned so much from her, and I’ve only being playing with her for a short amount of time. 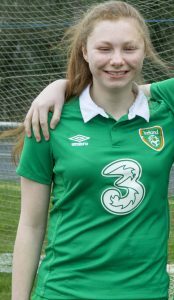 At Peamount too, there were so many players that I learned from so my point of view it has been an amazing opportunity to get that,” she said. With their European exploits now over, the team are fully concentrated on making sure they get the wins needs to ensure they lift the league title again. They were back to action five days after the Linfield game and showed no European hangover with a 4-0 win and have a chance to go nine points clear at the top of the table when they host second placed Shelbourne on Saturday. Verstaile Fahey has played in a number of positions but is enjoying a run in a new position at left back. “It has been a bit up and down for the last while being in midfield, at centre back and now left full. I’m really enjoying that position. Obviously you have to defend there but personally I do like to attack and I think that position allows me to attack much more than I get to when I am at centre back. I’m settling into it, obviously I’m making some mistakes because I am still new at but I am prepared to learn and stick at it,” she said.